Written by Jaxon S on Saturday, May 31st, 2008 in Borneo Music, Uncategorized. 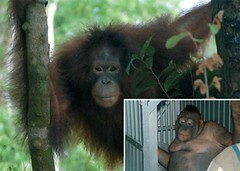 Written by Jaxon S on Saturday, May 31st, 2008 in Borneo Development Issues. Written by Jaxon S on Saturday, May 31st, 2008 in Uncategorized. Arinday: Revival of Sabah claim-Misuari’s last gambit? RENEWED rumblings from an erstwhile dormant problem are making some stirrings on the ground with the reported renewal of claim of oil-rich Sabah as part of the Philippines. And this time, no less than the former chair of the Moro National Liberation Front (MNLF) — Nur Misuari — is leading the movement for the Sultanate of Sulu, which ceded Sabah to the Philippines during the presidency of Diosdado Macapagal. Malaysia was reported to be furious about the resurrection of the contentious issues which prompted Sabah Progressive Party president Datuk Yong Teck Lee to call Malaysia’s National Security Council to impose stricter laws on Filipinos or suspend the ferry service between Zamboanga City and Sandakan, aside from the immediate preparedness of the Sabah security committee. Written by Jaxon S on Saturday, May 31st, 2008 in Borneo Flora and Fauna, Borneo Miscellaneous Stories. Written by Jaxon S on Sunday, May 25th, 2008 in Borneo Blog. Written by Jaxon S on Saturday, May 24th, 2008 in Borneo Native. On the contrary, the migration had taken place the other way around, according to the findings of a research team led by the University of Leeds. Prevailing theory suggests that the present-day populations of Island Southeast Asia (ISEA) originate largely from a Neolithic expansion from Taiwan driven by rice agriculture about 4,000 years ago — the so-called “Out of Taiwan” model. “However, an international research team, led by the UK’s first Professor of Archaeogenetics, Prof Martin Richards, has shown that a substantial fraction of their mitochondrial DNA lineages (inherited down the female line of descent), have been evolving within ISEA for a much longer period, possibly since modern humans arrived some 50,000 years ago,” the university said in a statement. Written by Jaxon S on Wednesday, May 21st, 2008 in Borneo Travel. The Lonely Planet’s Thorn Tree travel forum has a discussion thread about whether it is possible to go from Borneo to Singapore by boat. The answer is yes, you can go to Singapore from Borneo by boat according to one participant, but not directly as there is no boat service connecting the two islands. So the key is to find Batam in Indonesia from Borneo. Once there, it’s just a matter of a short one hour of comfortable boat ride to Singapore’s Harbour Front ferry terminal. Written by Jaxon S on Wednesday, May 21st, 2008 in Borneo Miscellaneous Stories. This is a re-mix of a 1931 black and white movie titled “Drunkards of Borneo”. I’m not sure who did the remix and whether the original movie was really about Borneo. May be it’s just a trailer of the real thing. I wonder where can I get the full-length version. Written by Jaxon S on Wednesday, May 21st, 2008 in Borneo Odds And Ends. Written by Jaxon S on Thursday, May 15th, 2008 in Borneo Blog. I’ve been working quite hard to get where this blog is now on Google. And it’s finally here on the main page for the keyword “Borneo Blog”. It used to be tucked away somewhere in the 6th or 7th page. Having reached this spot I should now work even harder to remain on the main page.